Hi @timelock, thanks for providing great diagnostic information. I’m not exactly sure what you mean by this Timo, I think you mean Opting in to the learning dataset - which is under Your Name -> Settings in home.mycroft.ai. Alternatively, install skills via the command line from our Skills Repo on GitHub"
I disconnect and reconnect, shut down and start Mycroft again but this does not help. Mycroft shows his mouth if i call him “hey Mycroft”, but asking him the standart skills like “how is the weather” or “how is the weather in cologne” he answered: please wait a moment as I finished booting up". Only thing i recognize every time between wake up and his answer is a quiet sound like a read head scratching over a CD. Any ideas what can help? Thanks @timo for a great description. What happens if you remove the Device then add the Device again? This means you will need to re-pair the Device. Hi Kathy, removing, rebooting and add the Device again does not fix the problem. Mycroft is paired but does not have any answer for me. And the clock option ist not under skills. Sorry to provide advice that didn’t work @timelock. This sounds like the mark-1 Skill may need to be reinstalled. Are you comfortable using ssh to connect to Mark 1? Mhmmm, I am a dumb Windows user. But I have no problems to try something. 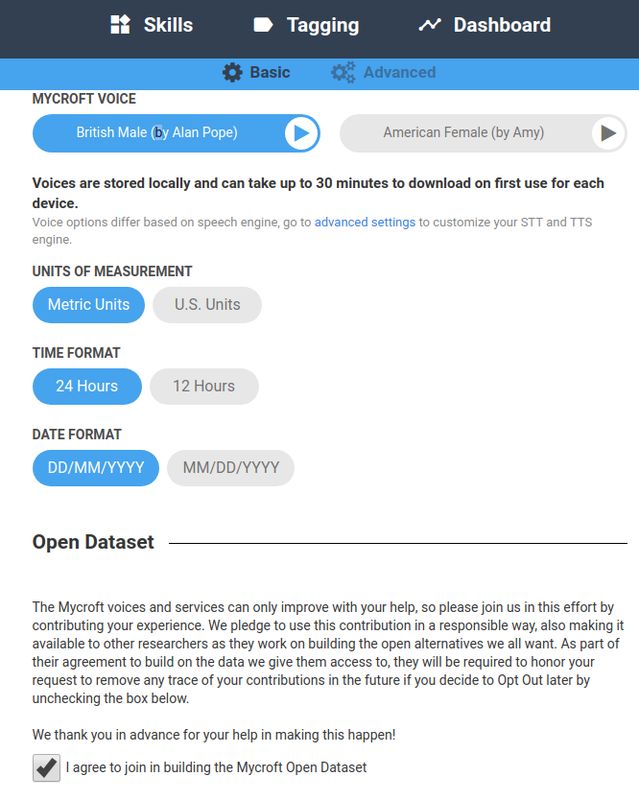 Think I have to connect Mycroft via lan cable, have to install a ssh client, have to download the firmeware and upload it to mycroft. If this is right can you recomend a win ssh client freeware and have you some links to download the firmeware and a step by step tutorial? OK, before going down this path, which seems quite involved, let’s see if we can get the Skill to fix itself. When the Mark 1 reboots, it checks to see if Skills are up to date, and tries to update Skills. If you try 2-3 reboots, does anything change? If not I can provide more information. Hey Kathy, in the meantime I found someone with linus coding knowledge. The next day he will have one or two hours for me. So if you post me the link to the firmeware and a short discription of the routine for rebuilding Mycroft the coder will do this for me. I dont know if it is important for him but do I need the IP from Mycroft? If yes remember that Mycroft is not talking to me and so I cant ask him for his IP. Unfortunately you will need the IP address to be able to connect to the device. I can think of a couple ways you might be able to look for the IP address. Also, the antivirus/anti-malware I run (ESET Smart Security, good stuff) has a section called “Connected Home Monitor” that shows what devices it sees on the network, whatever AV product you use may have a similar feature. For non-tech users the app “Fing” on your phone will do the trick just fine. I am also having same problem in my raspberry-pi3 as i am using picroft unstable image. Below the debug mode output. 12:55:12.075 - mycroft.skills.padatious_service:train:74 - INFO - Training complete. 12:55:35.275 - mycroft.skills.core:handler:1213 - WARNING - No fallback could handle intent. 12:55:35.285 - __main__:handle_complete_intent_failure:81 - INFO - Failed to find intent. 12:55:44.229 - mycroft.skills.core:handler:1213 - WARNING - No fallback could handle intent. 12:55:44.256 - __main__:handle_complete_intent_failure:81 - INFO - Failed to find intent. 12:55:47.614 - mycroft.skills.core:handler:1213 - WARNING - No fallback could handle intent. 12:55:47.674 - __main__:handle_complete_intent_failure:81 - INFO - Failed to find intent. 12:55:52.325 - __main__:handle_complete_intent_failure:81 - INFO - Failed to find intent. 12:55:52.316 - mycroft.skills.core:handler:1213 - WARNING - No fallback could handle intent. 13:39:34.799 - __main__:handle_complete_intent_failure:81 - INFO - Failed to find intent. 13:39:34.768 - mycroft.skills.core:handler:1213 - WARNING - No fallback could handle intent. 13:43:01.161 - mycroft.skills.core:handler:1213 - WARNING - No fallback could handle intent. 13:43:01.161 - __main__:handle_complete_intent_failure:81 - INFO - Failed to find intent. >> Please wait a moment as I finish booting up. Below the response from debug mode. 13:44:07.636 - mycroft.skills.padatious_service:train:74 - INFO - Training complete. 13:44:36.838 - __main__:handle_complete_intent_failure:81 - INFO - Failed to find intent. 13:44:36.817 - mycroft.skills.core:handler:1213 - WARNING - No fallback could handle intent. i was having a similar sort of issue. i was finding solutions and i came across this thread. thank you so much guys for your solutions, it helped me alot.